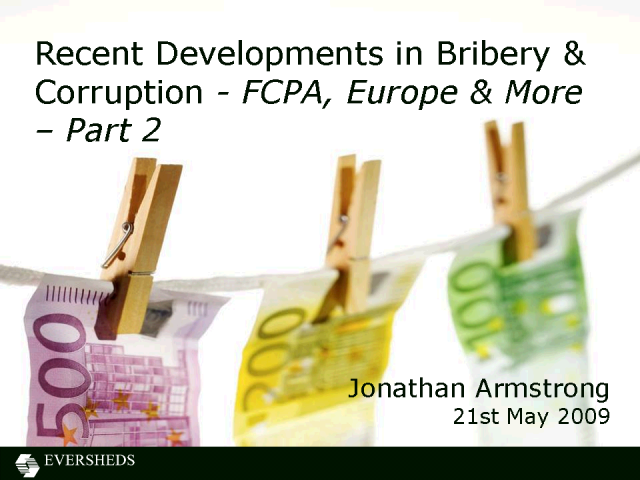 The May webcast on the Global Compliance Channel will focus on bribery & corruption building on last month's. Corruption has been headline news around the world in the last few months. In the second webcast we'll talk about the challenges in running an internal investigation and suggest practical steps you can take now to prevent or minimize the impact. We'll also look at new UK anti-bribery legislation. The Dodd-Frank Act will impact a wide range of compliance issues, including data protection, privilege and notions of when a lawyer working in-house would be recognized as a lawyer and not as a businessman. In Europe, Dodd-Frank has echoes in the 14 September decision by the ECJ in the Akzo Nobel case, holding that attorney-client privilege does not apply to advice from in-house lawyers. This month's webcast will cover the challenges of advertising and promoting a brand online. Glenn Manishin will cover the latest on the FTC's activities on blogging, behavioural advertising and online tracking live from DC. Jonathan Armstrong will look at developments in Europe including recent activity from advertising and privacy regulators and from the European Commission. All you ever wanted to know about the legal risks of cloud computing, but were too afraid to ask. In this month's webcast acclaimed technology lawyer Jonathan Armstrong gives a quick rundown of the legal issues of cloud computing including the latest news on regulatory developments in Europe, USA and Canada. Jonathan also discusses the UK regulator's draft checklist for cloud vendors and purchasers. Join us for a review of the second part of our review of the legal issues associated with social media and 'the new generation'. Experts from Duane Morris in Europe and the US look at the risks for corporations presented by social networks and how to minimize them. The emphasis this time around will be on the threats to intellectual property, regulatory activity and the need for transparency. We'll also walk through our checklist of steps you can take to reduce the risks including tips on how to draft your own social media policy and how to respond to a social media crisis. Join us for a review of the legal issues associated with social media and 'the new generation'. Experts from Duane Morris in Europe and the US look at the risks for corporations presented by social networks and how to minimize them. Topics covered include the risks of blogging, IP issues, twitter and the Robbie Hastie case - possibly the world's first criminal conviction for social networking. 2010 has already seen significant data legislation developments with new UK legislation. The end of 2009 saw a new EU Directive, the bedding down of new legislation in Germany and more US law. The coming months will keep up the pace of change. Our webcast shows you what the coming months will bring and how you need to change what you do now to meet those challenges. Presented by Sandra Jeskie live from Philadelphia and Jonathan Armstrong live from London this 30 minute update gives a global take on the year ahead. Webbugs (also known as web beacons and clear gifs) appear on almost every corporation's website. But do you know what they do? How does the law work? What is the risk to you? Who can litigate or prosecute over their use? In this practical webcast Jonathan explains the basics behind the technology and its use and looks at the latest cases - including the FTC's June settlement - to show the dangers. He also looks at the political momentum behind change in the US and in Europe explaining why this is likely to be one of the hot compliance topics of the next 12 months. The issues around compliance helplines & whistleblowing in Europe are well known with employee push back, works councils taking corporations to court and data privacy issues. But helplines form the backbone of most compliance programs. How can these issues be resolved? In the June webcast Jonathan gives his perspective on how to find a way through the minefield. The April webcast on the Global Compliance Channel will focus on bribery & corruption - headline news around the world in the last few months. We'll start with a round-up of recent cases - including a look at the Siemens cases in the US & Germany and recent UK cases which mirror the trend. In the second webcast we'll talk about the challenges in running an internal investigation and suggest practical steps you can take now to prevent or minimize the impact. We'll also look at new UK anti-bribery legislation. Jonathan Armstrong - with information from a team of legal experts from leading global law firms - presents his annual review of compliance events for the year just gone - and looks at what 2009 might have in store. The webcast features a special contribution on litigation and privilege issues from Jonathan Sinclair. Special emphasis is placed on the issues US corporations will have when doing business in Europe. Building on from October's primer on global data security this webcast discusses practical steps to make sure you comply with privacy, data security and data protection law across the globe. It focuses on the practical not the academic and uses real life examples to show you how to respond. Jonathan's talk looks at data security legislation in a global context and the politics behind data protection law across Europe. He shows how that will influence the law, its interpretation and enforcement. Jonathan shares real life experiences of dealing with the consequences of security breach, looks at current threats and how to take steps to try and avoid them. The Global Compliance Channel looks at the compliance issues of the day including issues around technology, privacy & security law. We look at the risks of using technology in a global enterprize - and how to reduce them. Channel leader Jonathan Armstrong is a renowned authority on these issues and a co-author of Managing Risk: Technology & Communications. Based in Europe, Jonathan and his guests take a holistic look at global risk.